Loung Ung was just five years old when Khmer Rouge soldiers stormed into her native city of Phnom Penh, Cambodia. Four years later, an estimated 1.7 million Cambodians had died - about a quarter of the population. Forced to leave her home, Loung and her family suffered unimaginable hardship and heartbreaking tragedy. However, Loung’s strength and indomitable spirit enabled her to carry on through the violence and devastating loss. Driven by a fierce need to protect her family, Loung was also determined to tell her story so that what happened during those dark days in Cambodia could never be forgotten. Based on Loung Ung’s memoir, First They Killed My Father; A Daughter of Cambodia Remembers, Angelina Jolie’s film is at once a heartbreaking and disturbing story of genocide and also a beautiful portrait of Cambodia and its people. We watch events unfold from the perspective of little Loung Ung (a stunning performance from Sareum Srey Moch - her eyes are simply haunting). Cinematographer, Anthony Dod Mantle, keeps his camera low - we see what she sees, for better or worse. Amid the horror, there are moments of startling beauty - Loung spots a brightly coloured flower or watches a sunbeam dance. However, heartbreakingly, what Loung sees is often for the worse - things no child should ever have to witness. As a result, First They Killed My Father is incredibly moving and upsetting. Thanks to Jolie’s impressive and sensitive storytelling, we care deeply about Loung and her family. As time progresses and circumstances change, it is impossible not to be touched by the steadfast tenderness they show one another, especially given the film’s ominous title. In addition to capturing Loung’s observations of the world around her, Anthony dod Mantle also utlises heady crane shots to give us a wider perspective of the events as they unfold. From this height we see the scale of the situation and witness just how many families like Loung’s were torn apart during the horrendous reign of the Khmer Rouge. Jolie certainly doesn’t hold back when depicting the horror of this time. The violence is unpredictable and incredibly visceral - all the more distressing when combined with Loung’s reactions. Moments of calm are full of anxiety as food becomes increasingly scarce. However, once again, there is also stunning beauty in the landscapes (even in many of the film’s most devastating scenes). Jolie never wants us to forget that it was some of the people, not the place, that committed this atrocity. Of course, the Khmer Rouge were not the only group to blame. First They Killed My Father also puts events in a wider historical context - drawing attention to the secret bombing campaign of Cambodia undertaken by the US. History has an awful way of repeating itself unless we remember stories such as those in this film. Thanks to the incredible bravery of survivors like Loung Ung and the passion of filmmakers like Angelina Jolie, we have no excuse to forget. You can watch First They Killed My Father via Netflix. The streaming service is, of coure, no stranger to films about a child's experience of war, having backed 2015's Beasts Of No Nation. First They Killed My Father was shot on location in Cambodia, between November 2015 and February 2016. It was filmed entirely in the Khmer language, and is the largest movie ever made in the country. The cast is made up entirely of Cambodian actors. Cambodian technicians, artisans and craftspeople comprised the largest portion of the crew, along with more than 3,500 Cambodian background actors. 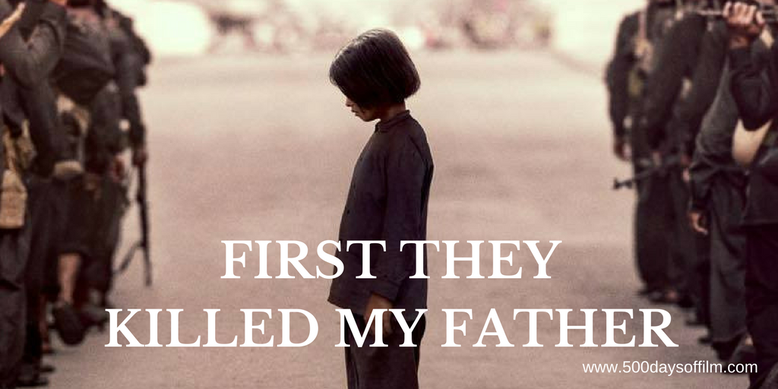 First They Killed My Father is Cambodia's Foreign Language entry for next year's Academy Awards. Have you seen First They Killed My Father? If you have, what did you think of Angelina Jolie’s film? Let me know by leaving me a comment in the box below or getting in touch via Facebook or Twitter (@500DaysOfFilm).